Quincy von der Weyermühle passed the ZTP with 1A rating for character and V for conformation. 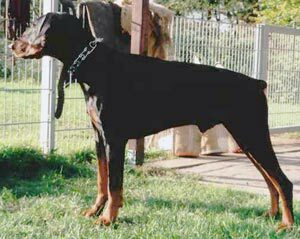 His litter-sister, Qastra von der Weyermühle, placed 2nd at the all-breeds Schutzhund 1 LV/DVG American Nationals in 1997 and rated SG for conformation. Quincy's sire, Ningicosan von der Weyermühle, placed 19th at the IDC Weltmeisterschaft in 1998 and passed the Körung 'for Life' with highest possible rating for working drives, courage and hardness. His dam, Hera von der Weyermühle, competed at the D.V. Meisterschaft in 1993 and also passed the ZTP with 1A rating for character.